Process Architectures & Organization Charts - IRM Connects, by IRM UK | IT Blog. In my working life I spend a lot of time with client organizations discovering and capturing useful models of their process architectures. In every country, industry sector, organization type and size, there is a common problem that bedevils every such project. We all, and I include myself here, can too easily slip into the habit of the last 100 years (or you might argue 1,000 years) of visualizing the organization as its organization chart. Comments such as “What about the work they do in department X?” might just be a useful test for a developing process architecture, or they might indicate a lack of understanding of what the process architecture represents. Comments such as “I can’t see my department in the process architecture” mean there is a lot of work to be done to create the necessary shared understanding of what the process architecture is, what it is not, and how it will be used. In capturing a process architecture, we are not looking to redraw the organization chart; we are looking to reshape how we see and think about the organization and how it creates, accumulates, and delivers value to its customers and other stakeholders. A process architecture is a hierarchical model of the processes of an organization. Usually created, initially at least, to include the two or three highest levels, the process architecture provides a powerful visualization and management tool. Developing a process architecture starts with the organizational strategy; it’s a top-down exercise. What does the strategy promise and to whom, i.e. what is(are) the organization’s value proposition(s)? Those delivery promises take us to the highest-level core processes and we work our way down from there—down as far as we need to, so that we can understand and improve organizational performance. Organizations get work done through collaboration across the organization (chart), so the process view can be seen as a ‘horizontal perspective’. The organization chart is a diagram showing graphically the relationships amongst the many personnel and positions of a company. It is also used to show the relation of one department or business unit to another, or of one function of an organization to another. An organizational chart typically illustrates relationships between people, and teams of people, within an organization, showing authorities and delegations. Most organization charts are drawn showing the senior entities at the top, giving an essentially vertical picture of organizational management. Hence the organization chart gives us the ‘vertical perspective’. In my view, and I think this is a fundamental and often misunderstood concept, the process architecture and the organization chart are different and unrelated. One does not replace the other. They are not in competition. A change in one does not require a change in the other. They are alternate perspectives of the organization. One says how we manage resources, the other shows how we get work done. Essentially, one shows who and the other how. We need both. To put the problem simply, we too often manage the vertical (functional) perspective and give little attention to the horizontal (process) view; the direction in which work gets done is not proactively managed in the traditional management model. A useful test is that an organization might have a very significant functional reorganization, i.e. change in the organization chart, and that will have no effect on the process architecture. Process architecture will only change if the strategy changes. 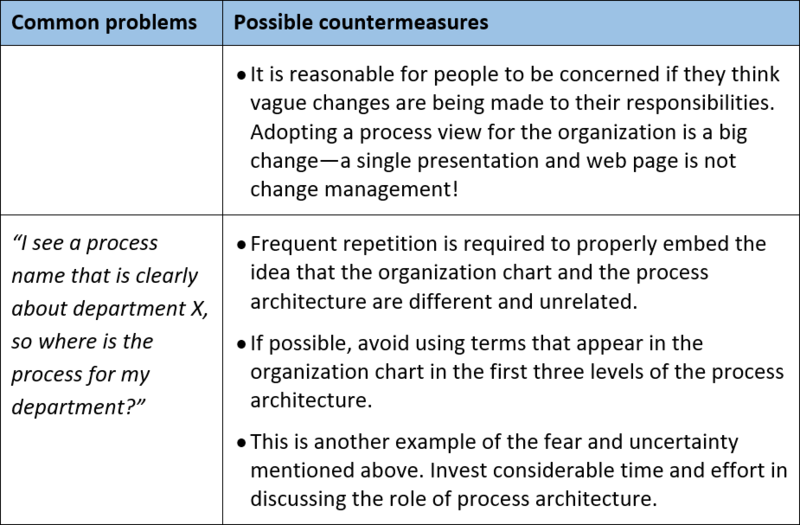 Some of the most common problems I see in documenting a process architecture are summarized below, along with countermeasures. Discovering and documenting the process architecture has no impact on the organization chart, and the chart should have no impact on the architecture. Processes, especially high-level cross-functional ones, are about what we do, not how we organize lots of people to contribute to the various parts. To achieve and sustain viable process-based management, we need, not only a well-developed process architecture, but a shared understanding of the role of the architecture and how it is independent of the structure of the organization. If the process architecture becomes just a redrawn version of the organization chart, simply showing the processes executed within individual business units, then effective process-based management cannot be achieved. Don’t replace functional silos with process tunnels. Roger Tregear brings 30 years’ experience to the BPM education and consulting assignments he has delivered in Australia, Bahrain, Belgium, Jordan, Nigeria, Netherlands, Saudi Arabia, South Africa, South Korea, Switzerland, New Zealand, United Arab Emirates, and the USA. His working life involves talking, thinking, and writing about analysis, improvement, innovation, and management of business processes. 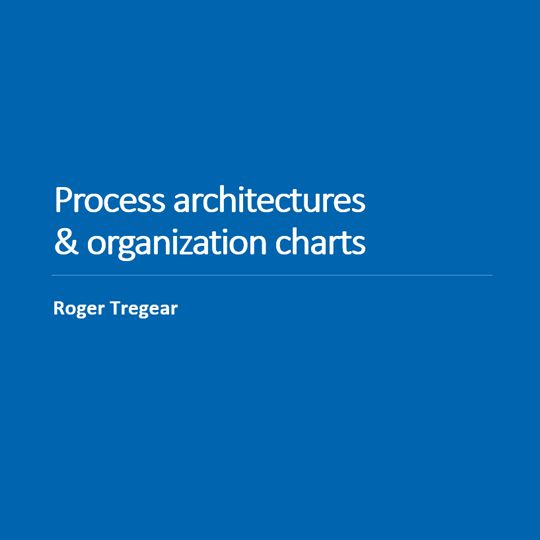 Roger is a regular BPTrends columnist, and author of Practical Process (2013), co-author of Establishing the Office of Business Process Management (2011), and contributed the chapter Business Process Standardization in The International Handbook on BPM (2010, 2015). With Paul Harmon, Roger edited Questioning BPM? (2016). Roger’s iconic book, Reimagining Management, was published in early 2017, and in the same year, Process Precepts involved a global team discussing the process of management.